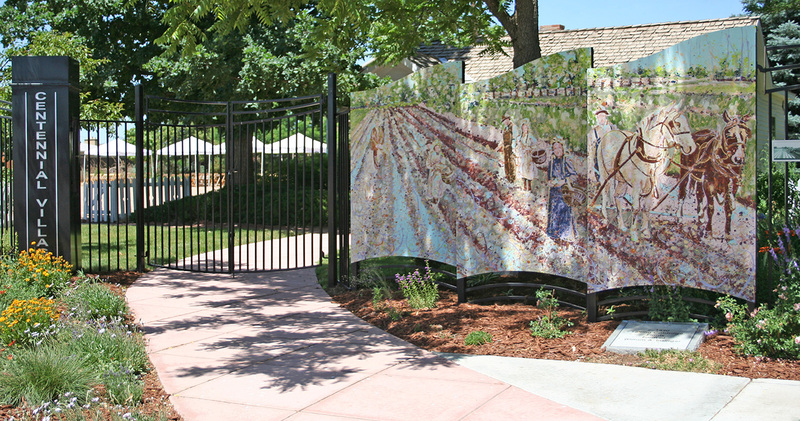 An Accumulative Public City Art Project creates an educational signature fence illustrating Greeley's water development and respectfully accents the treasures located on the grounds of the 'Living History Museum', Centennial Village. The fence is an interplay of painted steel mural panels and thoughtfully spaced and artfully crafted steel fencing. Viewers can explore together imagery of Greeley’s water canal development and the local structures on the park grounds derived in some cases because of it. Project includes time line pavers, path-finding imagery and a new welcoming plaza creating 1,140 total linear feet of artful and functional fencing. Includes 8 double sided, 4’W x 5’T painted interpretive panels to spark the interest of those with a thirst for history. Images referenced depict, Mosher Family Women Wading in the Cache la Poudre River, Greeley Water Works & Pumping Station, Setting Cabbage Plants, Irrigating a Beet Field, Irrigating on Abe Mumpher Farm, Bull Teams Pulling V-dredge to Form a Ditch, Laying Water Pipe for Greeley Water System, and Cultivating Potatoes. The second phase of an educational art fence illustrating the history of Greeley’s water development. Addition creates stunning entry & becomes the gateway for celebrations and community events in Historic Centennial Village Museum. Artwork depicts Monfort family & water development grandeur. Project includes 20, 4’W x 5’T painted interpretive panels to spark the interest of those with a thirst for history. Phase II Images include First Water at Adams Tunnel, C-BT Construction, Grandby Pump, Adams Tunnel Construction, Warren and Edith Monfort, Kenneth and Warren Monfort, Kenny Monfort, North Greeley Feed images and more. An open and airy design accents the architecture on the museum grounds. Steel panels undulate along walking path mimicking the fluidity of water and accenting beautifully manicured gardens. An accumulative project of educational fencing accenting the museum grounds continues from a grant awarded by the Poudre Heritage Alliance. This phase continues with historic references related to Greeley’s water history and the Poudre River. Images were selected and approved with committee members and myself. Tourists from the region visit the fence daily and can now view 42 painted imagery panels. Phase III images include Robert & James fishing on the Poudre, Ditch #2, and the Parshal Flume.